Jane is the seventh book I've read by Robin Maxwell, who enjoys writing fictional accounts of the strong and sometimes forgotten or overlooked women of history. I'm sure most readers will have a basic understanding of the Tarzan story: English child grows up in the wilds of Africa to become Tarzan of the Apes, as told to us by Edgar Rice Burroughs in 1912. Ashamedly, I haven't read this classic, probably put off by the comics and cartoon spin offs I came across as a kid. I felt safe in the hands of Robin Maxwell though, and so it was that I embarked on the story of Jane - The Woman Who Loved Tarzan. Jane Porter is a budding paleoanthropologist and the only female enrolled in the Cambridge University medical program. Her father is a scientist and explorer and together with a guide, they put together an expedition and head to Africa in pursuit of fossilised remains of the missing link species. I was pleasantly surprised by the unexpected depth to the story, although it has to be said that the first third of the book - concerned with planning the expedition to Africa - was slow going compared to the excitement of the story when Jane reaches Africa. My favourite parts were when Jane and Tarzan were learning to communicate with each other. 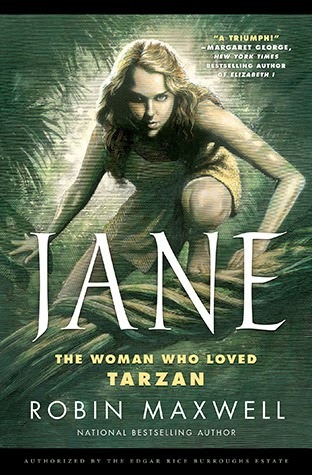 Jane is intelligent, capable and a woman ahead of her time, and far more than just Tarzan's love interest. Maxwell's writing shows a deep respect for the original work and in fact Jane has been endorsed by the Edgar Rice Burroughs Estate. The ending of Jane cleverly makes reference and fits in with the original Tarzan of the Apes, inspiring most readers to pick up the classic and find out more. This one is a MUST HAVE for me as when I was in primary school I would save my pocket money to buy the Edgar Rice Burroughs Tarzan series in paperback . Thanks May, I love it when that happens! I'd dearly like to hear what you thought of Jane when you finish, given your experience with the original series. I have finally finished "Jane" and admit to being pleasantly surprised. I found the storyline complemented the Edgar Rice Burroughs ' Tarzan very nicely. I agree that the first few chapters were a little tedious although it wasn't very long before we understood that Jane was a woman before her time ! The description of Jane cooling off in stream took me back to the 40s Tarzan movies with Margaret Sullivan and Johnny Wiesmuller. I wasn't at all disappointed in this book, unlike Scarlett, the appalling follow up of Gone With The Wind. It was an easy and enjoyable read and I look forward to another effort by Robin Maxwell. Thankyou for your review : it's a delightful way of becoming acquainted with new authors and genres! Hi May, thanks so much for coming back to share your thoughts on Jane, and I'm so glad you were 'pleasantly surprised'. And for a fan of the original Edgar Rice Burroughs series, that's definitely saying something!